When you need it to be good and fast! 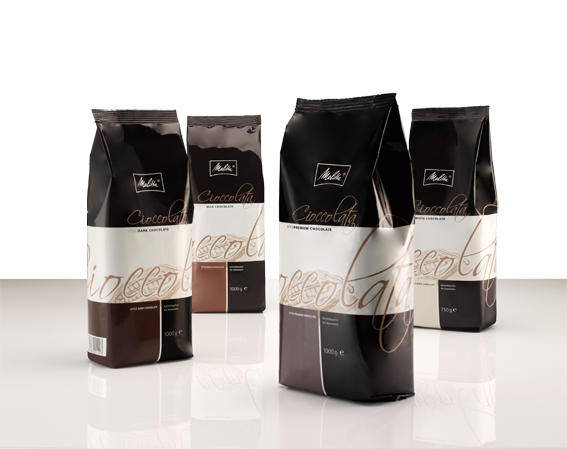 Melitta® Cioccolata - Four in a row! A celebration for the senses. An all-round success: With 27% fine cocoa, sugar and the finest whole milk powder, this deep brown, deliciously aromatic drink will captivate you. The composition, which contains no added ingredients, ensures a delicious cocoa drink in a jiffy. Simply heavenly: Melitta® fast coffees. Our already pre-portioned solutions, are even faster to make: Melitta® Instant coffee and Melitta® decaffeinated coffee – both in practical one-cup portions. The decaffeinated version is captivating with its well-rounded aroma and it is particularly gentle on the stomach. Selected aromatic and flavorful coffees round out this premium coffee. ... For the carefree enjoyment of coffee without irritants. Packaging unit: 200 g of glass. 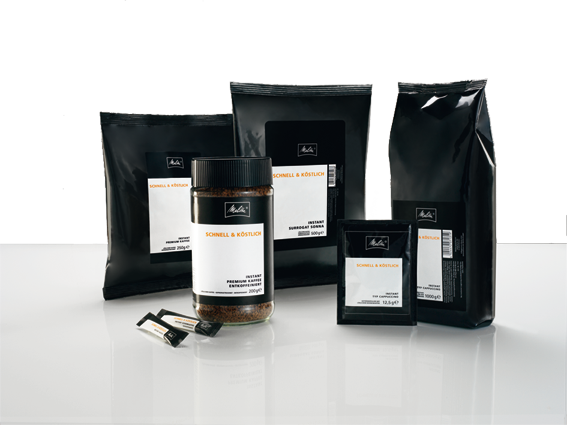 Instant coffee In practical cup serving package, freeze-dried. Packaging unit: Cup portion pack. 1.5 g sticks. The decaffeinated coffee boasts a rounded flavor and is particularly gentle on the stomach. 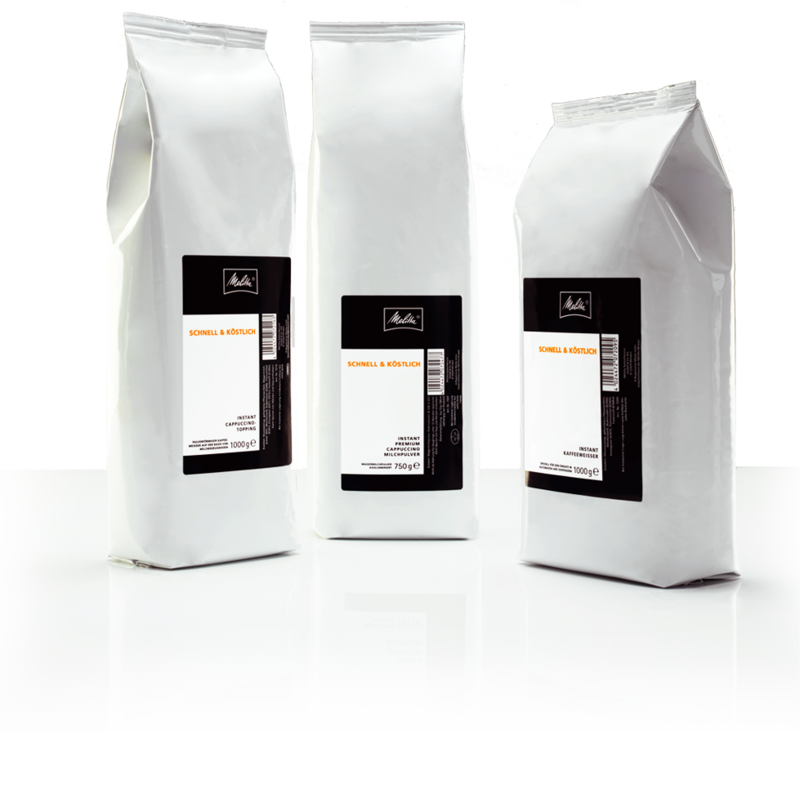 Soluble coffee beans, gently decaffeinated. Cup portion pack. Packaging unit: 1.5 g sticks. With a fine milk flavor - without fresh milk. Easy and quick to prepare! A wonderfully healthy drink made ​​from rye, chicory, malt and barley - free of stimulating caffeine. 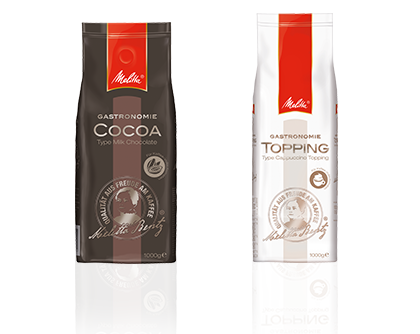 You want to offer your favorite coffee from Melitta® without fresh milk? Create a perfect milk foam on the basis of pure skimmed milk powder with Melitta® Cappuccino Topping milk powder to create. To succeed fantastic lattes, cappuccinos and great heavenly lattes in no time. And if no trace of coffee cream: no problem! The Melitta® coffee creamer makes every hot brewed delicacy a golden brown coffee enjoyment. Ideal for the preparation of perfect milk foam. To succeed fantastic lattes, cappuccinos and lattes in no time. The Melitta® coffee whitener makes every hot brewed delicacy a golden brown coffee. Especially suitable for use in vending machines and dispensers. Perfect Cappuccino even without fresh milk: Melitta® Gastronomie Topping allows you to create a perfect milk froth. Excellently suited to the creation of fantastic Lattes, great Cappuccinos and heavenly Latte Macchiatos with the automatic coffee machine. This delicious chocolate brown drink will genuinely soothe body, spirit and soul. 15% finest cocoa and other quality ingredients give it a velvety softness. The delicate sweetness means the drink provides comfort as it is savoured. This cocoa drink can also be enjoyed with milk or water and can be prepared by hand or machine.